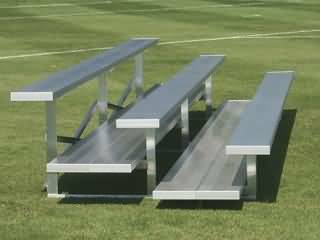 Our Preferred Sports Bleachers come with 2 Foot Planks. Our preferred bleachers have 2 foot planks which allows the spectator to move their feet slightly more forward creating a more comfortable seating experience. 3-Row- 7'6" Wide- Seats 15 - 179lbs. 3-Row- 12' Wide- Seats 24 - 261lbs. 3-Row- 15' Wide- Seats 30 - 290lbs. 3-Row- 21' Wide- Seats 42 - 409lbs. 3-Row- 24' Wide- Seats 48 - 463lbs. 3-Row- 27' Wide- Seats 54 - 515lbs. 5-Row- 15' Wide- Seats 50 - 868lbs. 5-Row- 18' Wide- Seats 60 - 1034lbs. 5-Row- 21' Wide- Seats 70 - 1137lbs. 5-Row- 24' Wide- Seats 80 - 1289lbs. 5-Row- 27' Wide- Seats 90 - 1410lbs. 5-Row- 30' Wide- Seats 100 - 1549lbs. 8-Row- 15' Wide- Seats 80 - 1441lbs. 8-Row- 18' Wide- Seats 96 - 1698lbs. 8-Row- 21' Wide- Seats 112 - 1873lbs. 8-Row- 24' Wide- Seats 128 - 2134lbs. 8-Row- 27' Wide- Seats 144 - 2335lbs. 8-Row- 30' Wide- Seats 160 - 2569lbs. 10-Row- 15' Wide- Seats 100 - 1828lbs. 10-Row- 18' Wide- Seats 120 - 2146lbs. 10-Row- 21' Wide- Seats 140 - 2368lbs. 10-Row- 24' Wide- Seats 160 - 2717lbs. 10-Row- 27' Wide- Seats 180 - 2969lbs. 10-Row- 30' Wide- Seats 200 - 3274lbs.